Mackenzie-Childs is world-famous for producing distinctive ceramics and home furnishings that offer a whimsical take on the classic garden party. Bold patterns and colors are artfully blended to create pieces that are at once commanding and yet refined and never overdone. The Mackenzie-Childs aesthetic blends sophistication with playfulness in a way that makes them an easy addition to most homes, especially rooms in the French provincial, English and classic American styles. When selecting handcrafted decorative pieces as distinctive as MacKenzie-Childs, particular attention should be paid to the storage or display. After all, MacKenzie-Childs tableware collections feature beautiful plates, bowls, glassware and tabletop accessories that are essentially functional art. The design team at ChelseaGiftsOnline created the following guidelines to help you incorporate the most coveted MacKenzie-Childs lines into your home. If your kitchen or dining room leans towards a neutral pallet, including off-white, eggshell and brighter whites, look to MacKenzie-Childs Flower Market collection to add sophisticated splashes of color without becoming gaudy or overbearing. The bold, vibrant Flower Market collection will bring life and youthfulness to a monochrome space. Use the Flower Market platter as a decorative piece by displaying it on a plate rack or holder. Set out your MacKenzie-Childs Flower Market chargers, salad plates and bowls on the table, with contrasting Courtly Check placemats & napkins to finish off the look of your dining room or kitchen table. For an antique, French provincial, or classic country-style kitchen, consider the iconic MacKenzie-Childs Courtly Check design. 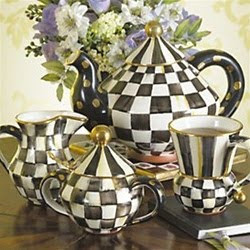 Perhaps the most sought after product line MacKenzie-Childs has ever produced, the simple, yet highly coveted Courtly Checks blend into any kitchen’s color scheme while also serving as functional tableware because of their more durable ceramic-glaze finish. Place your MacKenzie-Childs Courtly Check dishes, bowls, cups and mugs upright in an open, full-view kitchen cabinet to showcase the recognizable Courtly Checks without occupying space. The checkered pattern really pops against dark browns and yellows. Get creative with your Courtly Check cups and mugs, by attaching hooks to the underside of cabinets and hang drink ware by their handles. This saves space and time while also displaying the delightful patterns. This simple adjustment can have more design impact than a brand new back splash. For a more formal, elegant kitchen we highly recommend the ornate MacKenzie-Childs Trapeze collection. The Trapeze dinner plates, vases and bowls, though unique in their shape and design, are detailed with stunning gold, green and berry details that tie the entire collection together. MacKenzie-Childs designs are never shy or timid, nor should you be. Show off these timeless styles in a formal dining room, hutch or on top of cabinets. Place the Trapeze collection in a china cabinet with glass doors so that you and your guests can admire the exquisite designs when they are not in use. Set the formal dining room table with the Trapeze collection. Play with the hues of your MacKenzie-Childs Table toppers, placemats, tablecloth and napkins; feel free to use bold tones to further bring out the Trapeze artistry. How do you display your MacKenzie-Childs line? Share some tips with our readers below! About the Author: Edward Cain is the co-owner of Chelsea at the Grove, a luxury boutique specializing in luxury designer gifts and home décor located in Shrewsbury, New Jersey in the heart of picturesque Monmouth County. Chelsea at the Grove is proud to feature the highly sought after MacKenzie-Childs collection, including their highly sought after furniture and the MacKenzie-Childs Courtly Check Collection.